Protasco Berhad is a 20-plus-year company which involves in few business segments. Apart from the core business which is construction & maintenance segment, the group also has engineering service, construction material trading and education & training. Apart from that, the group also ventured into property segment since year 2008. The group's core business, construction and maintenance segment involves in construction of new road, buildings and bridges as well as maintenance works. The group has two 15-year federal road maintenance concessions and three 7-year contracts for the maintenance of state roads in Selangor, Perak and Terengganu. Besides, the group also has road maintenance jobs in Libya. Based on the past 7 years result, the group able to record a CAGR of 5.7% in terms of revenue. Due to the nature of its business & contracts, not much growth would be seen from its core business. That’s why the managing director once said before that the group need to venture into other segments like property and oil & gas business in order for the company to grow faster as the growth to construct new road and maintenance is quite slow. Throughout the years, the group able to record a gross profit margin of around 25% but it turn out to have a poor net profit margin of around 5%. Special thanks to its high administrative cost and other expenses as well as high non-controlling interests in its construction & maintenance subsidiary as you can see from the table, the non-controlling interest percentage range from 26-47%. This causes the group a little bit of inconsistency in its net profit. Else way, the group is good at giving out dividend which has a dividend payout ratio of 60-70% at which there was a special dividend last year as well. Not expect there will be another special dividend this year as the group need some cash for its property development and acquisition. Poor thing of Protasco is the group does not reach the benchmark ROE of above 15% all this while. In terms of cash flow, the group consistently spent around RM21m annually for capex, which gave positive free cash flow every years. This explains why the group had much spare cash left and paid out dividends to its shareholders. Owner’s earnings/sales averagely stood at 5%, which is slightly stood at the benchmark. 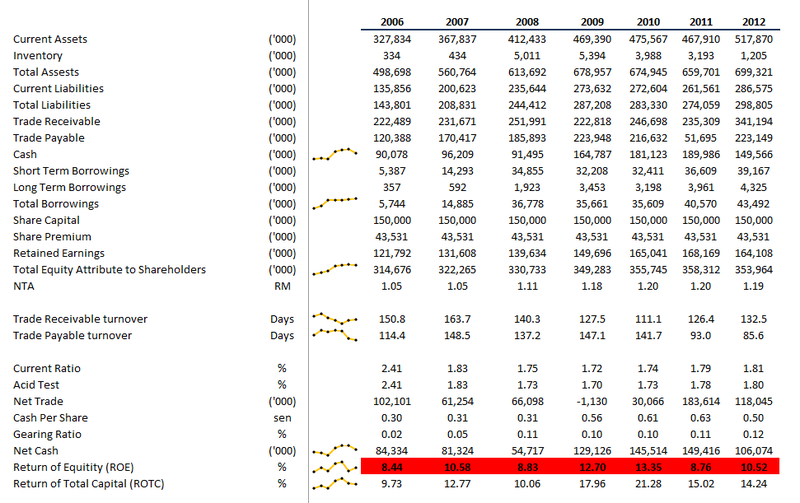 Above table shows the operating profit breakdown of the group’s segment for the past few years. Construction and maintenance acts as the back bone and generate recurring income for the group. Big drop in revenue and net profit in year 2012 for the engineering services department was due to higher provision for doubtful debts and expiry of government concession in 2011. Drop in revenue and net profit in year 2011 was due to losses incurred in Libya and higher construction material costs. Both education and trading segments were showing some downward trend in contributing to its group revenue even the education segment had been upgraded to university status in FY2011. It’s all still depends on the property segment for future growth. The De Centrum City in Kajang has a master plan of GDV of RM4.5billion with development period of 10-15 years which the management targets the property alone to contribute at least quarter of the group's operating profit by 2015. For the 9 months period of FY2013, the property segment already recorded around RM4.7m operating profit. In addition, the group just received a contract of RM578m to construct apartments in Oct 2013 for a 24 months development period. The group managing director, Dato Ir Chong Ket Pen and ex-deputy chairman, Dato Ir Hasnur Rabiain bin Ismail (resigned in 2012) co-founded the company in 1991. Both graduated as civil engineer and began their career as road design engineer at PWD and JKR respectively. Both involved in R&D extensively throughout their career and having extensive experience in design, maintenance of road pavement. 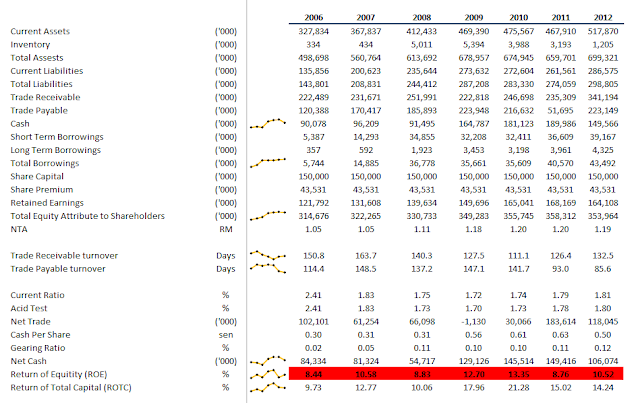 The group perform share by back every years but the quantity become lesser in FY2011 & FY2012. But the company did purchase back twice with huge amount each which total up to 17.3 millions shares being purchased in March 2013. LTH was once the substantial shareholders but just ceased of the status last month and Fong SiLing becomes one of the shareholders with 1.5million shares in annual report FY2012. 2 private placement with a total of 27.4m ordinary shares were listed in 2013 that raised around RM30m. No. of shares increase by around 9.2% as a result of these private placement. EPS probably will be diluted a bit. Overall, it’s a mediocre company for me. Perhaps the ROE will improve once there is bigger recognition from the property segment and push up the earnings as well. Regarding the planned acquisition of PT Anglo Slavic in Indonesia for about USD55m which open yet another segment for the group, I’m not good enough to comment about this as the acquisition cost consider quite big as it covers almost half its shareholders equity and there is not much info declared. Well, just continue monitor and see the outcome. Great work! 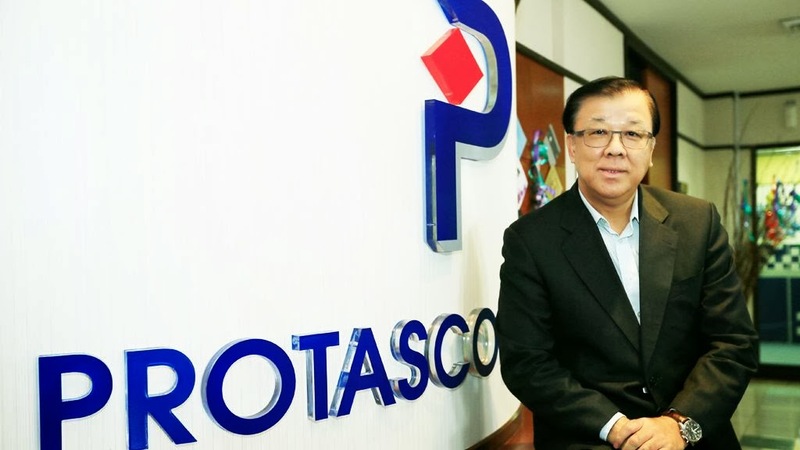 I think if the acquisition of O&G company in Indonesia goes through as planned, that would be a massive lift for Protasco. Anyway, may I know how do you create the charts above? Thanks. Do you mean the line at the column beside year 2006? Regarding the line chart, it's called sparklines. One of the new features in 2010 version. Thanks for the great analysis on PRTASCO. :) By the way, any plan to analyse Hua Yang? Thanks! Just the company net gearing ratio is quite high, around 0.58 due to the loan it took to purchase the land earlier. Elseway, the management target to achieve RM500 sales this year too.